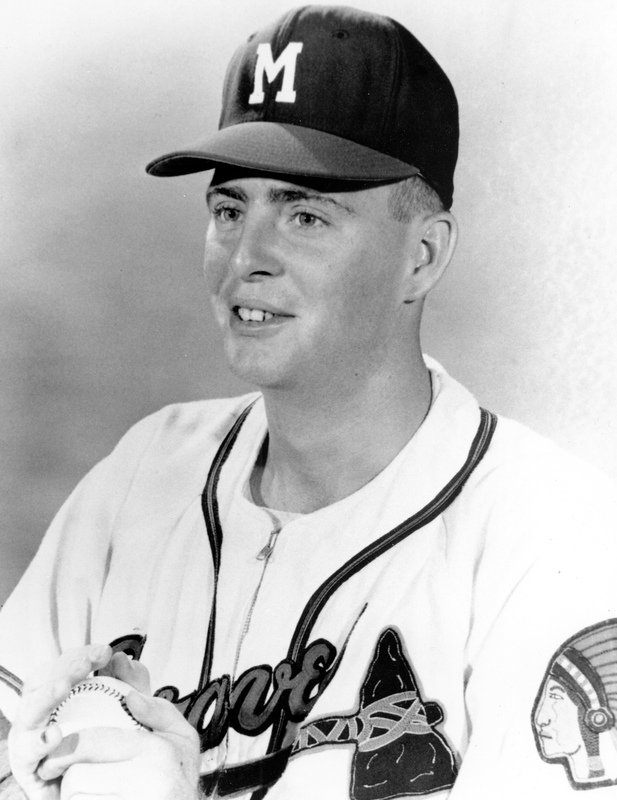 Taylor Phillips had an outstanding career in armed-services baseball, good seasons in the minor leagues, and a six-year major-league career highlighted by being part of the 1957 world champion Milwaukee Braves. Phillips attended Douglas County High School and earned letters in baseball for three years, graduating in 1950. He attended the University of Georgia on a baseball scholarship for one semester. Atlanta Crackers scout Skipper Bartlett noticed Phillips while Taylor was pitching for the Marietta (Georgia) Bombers American Legion Junior baseball team during the 1950 State American Legion finals. (Marietta lost to Savannah in the tournament finals.) Phillips was also approached by a New York Yankees scout. The team’s manager, Marietta School Superintendent Shuler Antley, who had coached major leaguer Whitlow Wyatt at Cedartown High School, considered Phillips the best pitching prospect he had seen since Wyatt, and thought Phillips had an excellent chance to make the major leagues. Phillips posted amazing statistics during the Legion season; his record was 23-4, with all four losses decided by one or two runs. In a two-game stretch, he allowed a total of three hits, taking no-hitters into the seventh inning of each contest, while striking out 19 in one of the games. During one stretch, Phillips pitched six games in eight days. At the age of 17, Phillips began his professional career with the Waycross Bears of the Class D Georgia-Florida League. In 1951 he had a 10-8 record with a 4.25 ERA in 167 innings, walking 162 and striking out 125. His victories included a no-hitter and a one-hitter. The next season Phillips was promoted to the Crackers. “I progressed a little fast and was always the youngest player on each team,” Phillips said in the Sports Collectors Digest article. “It was a challenge to be playing with my heroes, seeing their names in the paper one year, and playing with them the next. Being put in the same company as those guys was really fantastic for a country boy.” One of his biggest thrills took place on July 8, when, as a member of the Southern Association All-Star team, he pitched two innings of shutout baseball to close the game for the All-Stars in their 8-6 victory over Nashville. Another notable event of the 1953 season was the genesis of his nickname, T-Bone. The Crackers had another Taylor, pitcher Jack Taylor, so to avoid confusion Taylor Phillips was referred to as “T,” with the “Bone” being added later. After the 1953 season Phillips was drafted into the Army. He was stationed at Fort McPherson, near Atlanta. The base team played a 130-game schedule in 1954. Phillips won eight of his first nine decisions and in the first 77 innings he had a 0.81 ERA, striking out 91, giving up 49 hits, and walking 45. Fort McPherson fielded an impressive 17-man roster for the 1955 season. Eleven of the players had major-league contracts, including pitchers Vinegar Bend Mizell and Billy O’Dell, infielder Frank Bolling and outfielder Norm Siebern. Phillips hurled a no-hitter against Fort Benning (Georgia) and another one against Fort McClellan (Alabama), striking out 21 batters. He finished the season with a 21-0 record, the same as Mizell. At season’s end, Phillips’s team captured the All-Army World Tournament, held at Fort Belvoir (Virginia). Discharged from the Army on November 15, 1955, Phillips wasted little time returning to baseball, joining the Caguas-Guayama team managed by Ben Geraghty in the Puerto Rican winter league. Felix Mantilla, Tommy Lasorda, and Wes Covington were also on the Caguas roster. Phillips won outings against National Leaguers Ruben Gomez and Jim Owens. He finished with a 6-3 record as Caguas captured the league title, defeating Santurce, the regular season champ, in six games in the league playoff. “We’re certain Taylor Phillips is going to do the job for us,” Cubs manager Bob Scheffing said. “I know he has the stuff. It may take him a while to get into the groove because he only pitched 73 innings last year.” Phillips had a rough spring training, but the Cubs needed him to excel as a starter, because Moe Drabowsky was on the disabled list with a serious throat infection. Phillips picked up his first victory in a Cubs uniform on May 7, defeating the Cincinnati Redlegs in a five-hitter. On the 21st he improved his record to 2-0 with another complete-game five-hitter, against Pittsburgh. Phillips finished the season with a 7-10 record, appearing in 39 games, starting 27, and posting a 4.76 ERA. “Wrigley Field’s not the easiest place in the world to pitch,” he commented. It wasn’t much fun playing for the last-place Phillies. In his interview in Sports Collectors Digest, Phillips said, “I didn’t care for the Phillies at all. That was probably one of the worst teams I’ve been on. But Philadelphia had one of the best persons I’ve ever met in my life and that was Robin Roberts. And I was fortunate (that) my roommate was Jim Hegan, a catcher from Cleveland. Some good people, but they were all on the way down.” Phillips went 1-4 for the Phillies with a 5.00 ERA. His victory, 3-2 in a rain-shortened six-inning game against Los Angeles on July 19 in Philadelphia, was the only victory of the season by a Phillies southpaw. Phillips began the 1960 season with Triple-A Buffalo. In midseason he was called up by the Phillies and appeared in ten games, pitching 14 innings and posting an 8.36 ERA. He finished the season back in Buffalo, where he went 6-3 with a 3.65 ERA.On March 27, 1961, before beginning the season with Buffalo, Phillips married Betty Ferguson of Hiram, Georgia. They had met on a blind date at a square dance three years earlier. The ceremony took place at the Calvary First Baptist Church in Clearwater, Florida. At Buffalo, Phillips struggled with an 0-1 record and a 7.07 ERA in 14 innings pitched. In early June he was loaned to the Dallas-Fort Worth Rangers, a Triple-A affiliate of the Los Angeles Angels in the American Association. In his first starting assignment, he pitched a three-hit, 3-0 victory over Louisville. He finished the season with an 8-6 record and a 3.46 ERA. After the season Phillips and utilityman Bob Sadowski were traded by Philadelphia to the Chicago White Sox for pitcher Frank Barnes and third baseman Andy Carey. Phillips and Sadowski were assigned to Triple-A Indianapolis. Phillips spent the entire 1962 season with Indianapolis, posting an 8-5 record with a sparkling 2.11 ERA. One of his highlights was a 2-0 two-hitter against Dallas-Fort Worth. The Indians won the American Association title but lost to Louisville in the Junior World Series. Phillips played winter baseball for the Rapinos in Venezuela. (The team was owned by Luis Aparicio.) He had an outstanding season, going 10-4 with a 2.73 ERA and leading the league in strikeouts. After posting a 4-4 record with a 2.86 ERA for Indianapolis in the first half of the 1963 season, Phillips was called up by the White Sox on July 16. His White Sox debut, on July 23, was anything but auspicious. Entering a tie game in Detroit with two outs, he gave up a grand slam to Norm Cash. He appeared in nine games in all, pitching 14 innings and posting a 10.29 ERA. After coming off the disabled list, Phillips was released. He signed with the Triple-A Atlanta Crackers to finish the season. Phillips was a part of a memorable moment while pitching for Atlanta on September 10, throwing the last pitch at Atlanta’s Ponce de Leon Park and retiring Johnny Lewis on a grounder to first. After the game, Phillips took a large chunk of sod from the park, and planted it in his yard, where it remains as green as ever. The batting-practice job ended when Phillips had to transfer to another post office and his hours changed. He stayed involved with baseball, working as a volunteer giving lessons to local players. He estimated that he was helpful in helping around 100 athletes obtain scholarships. One of his more noteworthy pupils was Matt Capps, a pitcher who became a major leaguer in 2005 and was still pitching in 2013. Phillips was also active as a coach in American Legion baseball. Phillips retired from the Postal Service after 28 years, enabling him to spend time with his children, Debra, Karen, John, Kyle, and an adopted daughter, Beth. Taylor and Betty as of 2013 had nine grandchildren. In addition to a telephone interview with Taylor Phillips on January 25, 2013, the author accessed Phillips’s player file from the National Baseball Hall of Fame, and consulted Retrosheet and Baseball-Reference.com. Newspapers consulted include the Milwaukee Journal, Milwaukee Sentinel, and The Sporting News. Povletich, William, Milwaukee Braves: Heroes and Heartbreak (Madison, Wisconsin: Wisconsin Historical Society Press, 2009). Joe Baggett, “Satisfied: Phillips Reflects Back On His Pro Career,” Neighbor News, no date, no page (in Phillips’s file at the Baseball Hall of Fame). Bill Ballew, “Taylor Phillips recalls his days in the majors,” Sports Collectors Digest, June 15, 1990, 280. Al Thomy, “Rookie No Longer, Phillips Aims High in Braves World,” Atlanta Constitution, February 13, 1957. Bob Wolf, “The Silver Lining: Taylor Phillips, Rookie Lefty Shows Plenty,” Milwaukee Journal, June 9, 1956, 10. Bob Wolf, “Rookie Taylor Phillips Is No Shrinking Violet, Takes Victory Calmly,” Milwaukee Journal, July 16,1956, 9. The Sporting News, February 6, 1957, 6. Bob Wolf, “Braves Still Reeling After Worst Licking,” Milwaukee Journal, August 16, 1957, 12. “Quickly Quoted,” Milwaukee Journal, December 11, 1957, 21. The Sporting News, January 22, 1958, 7. Steve Weller, “New Taylor Phillips is Far Cry from Old; Some Excitement Has Gone Out of Hurling,” Milwaukee Journal, May 26, 1958, 12. The Sporting News, June 6, 1958, 9. The Sporting News, March 4, 1959, 15. The Sporting News, May 20, 1959, 25. Taylor Phillips, telephone interview with author, January 25, 2013.